www.HoffySwims.com: Liam Fairhurst - 26-02-1995 to 30-06-2009 - "Life is measured in achievement not in years alone"
Liam Fairhurst - 26-02-1995 to 30-06-2009 - "Life is measured in achievement not in years alone"
14 year old Liam Fairhurst from Soham in Cambridgeshire, died on June 30, 2009. His requiem mass was held today July 10, 2009 in Newmarket, Suffolk. Below is my small tribute to a truly inspirational and courageous boy who became a simply astonishing fundraiser for CLIC Sargent, the children's cancer charity through which I had the honour of meeting him and his family. "Liam's problems with his leg manifested in APRIL 2005 after a fall from a neighbours trampoline. For the previous year or so he had always had an odd style of walking. But after the fall this got worse, he complained of pain in his left leg and we noticed that the muscle to the thigh became hard. We did seek medical advice but in fairness to all those who saw Liam he was not presenting with any symptoms other than those you would expect after a fall. 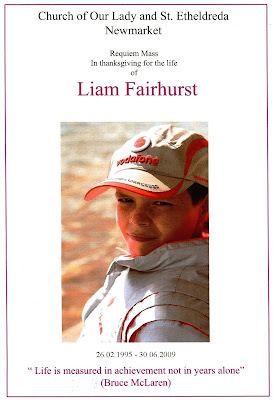 At the end of June 2005 Liam complained that the pain was getting worse and he found it difficult to walk. On showing me his leg I noticed the upper left leg had swollen to over twice its normal size and immediately alarm bells rung. I must admit I immediately thought it was cancer. Mark took Liam to the doctors who were very quick in referring us on to WEST SUFFOLK HOSPITAL and within the week we were at THE ROYAL ORTHOPEDIC in BIRMINGHAM where Liam had a biopsy on his left leg and also other body scans. A week later we received a call telling us what we already knew Liam had cancer a SYNOVIAL SARCOMA in his leg and worryingly/unexpectedly secondaries in his left lung (three nodules). It was like being in a parallel universe our whole world stopped and within a week Liam was in ADDENBROOKES undergoing the first of seven courses of chemotherapy fed through a central line. Liam had never been in hospital let alone had an operation. He is an intelligent and articulate child and was like us scared and depressed. Despite this he quickly realised that the only way to get better was to BE POSITIVE and he managed to do this despite constant bouts of sickness, tiredness and ulcers that invaded most bodily orifices. After 4 chemos the nodules had gone and the leg cancer had reduced by 70%. Liam then went back to BIRMINGHAM for an op to remove the remaining tumour and thanks to the skill of the surgical team he kept his leg. Liam lost half of the quadriceps muscle and one of his knee muscles but was up and walking the next day. He returned to ADDENBROOKES for the remaining three chemos and then underwent 6weeks of daily (mon-fri) radiotheraphy finishing 22nd December 2005. We received the all clear after scans in mid January. Liam at present has 3 monthly chest xrays and four monthly MRI scans back at ADDENBROOKES. He wanted to do the [1 mile sponsored] swim because he said he was aware that some children weren't as lucky as him. Some of their treatments lasted longer than his and others died in particular JACK WILKINSON a 12 year old he befriended whilst in ward C2. He chose CLIC Sargent because he felt the money went to the right people and helped children and families like his." 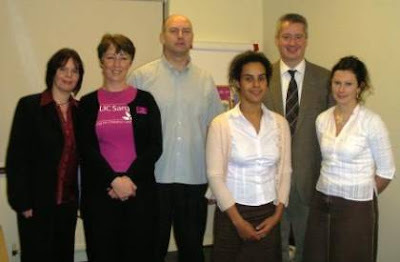 Above left to right, December 06, 2006: Sarah Fairhurst, (Liam's Mum), Karen Roberts (CLIC Sargent) Mark Fairhurst (Liam's Dad) Kim Williams (Social Worker Assistant, CLIC Sargent, Adenbrookes Hospital, Cambridge), me and Rachel Goodman (Social Worker, CLIC Sargent, Adenbrookes Hospital). 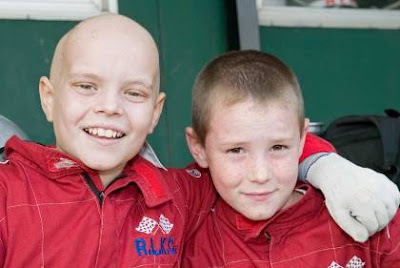 Above: 11 year old Liam Fairhurst after surgery/chemotherapy and radiotherapy with brother Callum. Liam's Mile - 1 Mile Sponsored swim, December 22, 2006. I was invited to attend the Next Generation Gym in Cambridge, where I had the honour of meeting Liam for the first time. I had to admit, that I was nervous before meeting him as he had already inspired me and touched me before I had even met him. 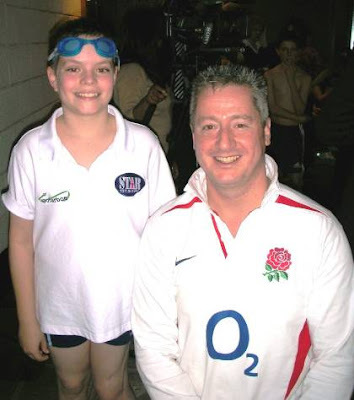 Above: 11 year old Liam Fairhurst at our first meeting just prior to his "Liam's Mile" swim on December 22, 2006. I watched in awe as this courageous young man pumped out length after length after length of the pool, exactly a year after being given the all clear from his cancer. It was so inspiring and humbling to be there. When he was on the final length, the whole pool was shouting, and screaming, and when he touched the end of the pool, everyone went mad. He had done it, and in the process had raised over £12,000 for CLIC Sargent! But there was more to come. Above: Liam turns during his awesome 1 mile swim, just 1 year after being given the all clear from his cancer. Above left to right: Me, Liam Fairhurst and Karen Roberts celebrate Liam's 12th Birthday at The Next Generation Gym, Cambridge. 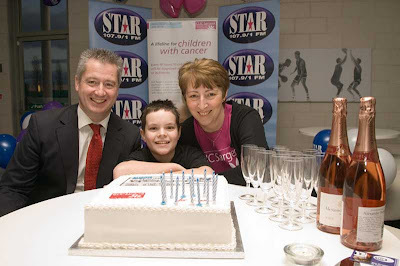 On Monday February 26th, 2007, my wife Beccy and I were delighted and honoured to be invited to Liam's 12th birthday party. He was so excited and happy that day. He also had a special cake made which had a cheque on it telling us that he had raised an absolutely staggering £70,000 for CLIC Sargent by doing his 1 mile swim. It was a very special day, for a very special boy and a special family, and it was an honour to be there. But less than a week later we received some terrible news. "This morning I received a telephone call from a mutual acquaintance who asked me how I was. I told her that I was not very happy because the doctor had just given me more antibiotics for my persistent ear infection, which was stopping me training for the channel swim. As I sat there feeling sorry for myself, she hit me with a killer blow. "I've got some bad news" she said, "Liam's cancer has come back". I was dumbstruck. We had a long conversation about it, but in a nutshell they are optimistic that they have caught it early. He will undergo chemotherapy followed by an operation to remove the cancer and is receiving the full support of CLIC Sargent. I really can't express the emotion I am feeling at present, but I urge everyone who reads this to please donate just £10.00 to CLIC Sargent by clicking on the link below. More if at all possible. Liam's family, and many others like them need your money. I would like to say this to Liam. "Liam, you are a fighter. You have got through this once, and you will get through this again. I am not now just swimming the the channel for CLIC Sargent and St. Nicholas' Hospice, I AM SWIMMING IT FOR YOU. If you can swim a whole mile having been through what you have been through, I can swim that little old channel for you." His website shows just what a truly remarkable, selfless, courageous and inspirational person he was. At his requiem mass today, his mum announced that at the time of his death he had raised a staggering £321,000 pounds for CLIC Sargent. He loved CLIC Sargent, and spent his last 4 years doing as much as he possibly could to raise money for them. There is a link at the base of this tribute where you can donae directly to them if you wish to do so. As his coffin left the packed church to the sound of Heather Small's song "Proud", there was not a dry eye in the church. This truly remarkable young man crammed more into his 14 short years, and touched more people than many do in a lifetime. Liam, it was an honour and a privilege to have known you. Rest in peace.